Luxury watchmaker Ulysse Nardin has created a unique Marine Diver timepiece in aid of children’s cancer charity the Kika Foundation. The watch was sold as part of a nautical themed auction at a fundraising gala on the closing night of Baselworld, with all profits going towards scientific research into childhood cancer. One of the new generation of Marine Diver 2014 timepieces, the watch draws on Ulysse Nardin’s nautical heritage to become both a fine sports watch and practical diving instrument. The newly designed case is waterproof up to 300 metres and finished with a handsome blue dial and bezel decorated with a wave-like motif. Along with “Conquer the ocean” engraved to the back of the case, this unique charity timepiece features the Kika Foundation logo to the titanium element of the watch’s rubber strap, making it a true one-off. This Marine Diver model usually retails for around £5,700. The Kika Foundation is a Dutch organisation founded by Frits Hirschstein which aims to achieve a 95 per cent cure rate of all childhood cancers by 2025. 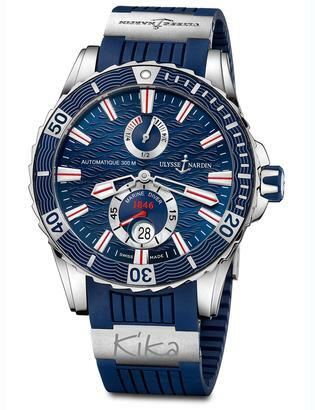 To read more about the work of the Kika Foundation and the Ulysse Nardin Marine Diver watch visit kika.nl and ulysse-nardin.com.